Welcome to the Portland Tribune's new food and drink column. Expect monthly stories to deliver chef interviews, samples of Portland-made food products, and tastes of Portland's rapid-boil food and drink scene. While we plan to whet appetites and satisfy cravings for hot new flavors, January is the month many people vow to eat better, which means it can be a slightly bland time of year. Goals vary: Drop a few extra pounds, reset out-of-control appetites, or just pass on the Goose Hollow Inn's Reuben sandwich altogether. • Dry-uary is not so dreary. So you ditched alcohol for January. For some, this means forming new, healthier drinking habits. For instance, we're going through a ton of Oregon-made Brew Dr.'s Kombucha. The bubbly probiotic tea is almost as tantalizing as the hazy IPAs and sparkling rosés we swam in all summer. We're especially fond of the Brew Dr.'s "Clear Mind," a fermented blend flavored with rosemary, peppermint and sage. So, now that our minds are clear, and we're seeing all the angles, what next? 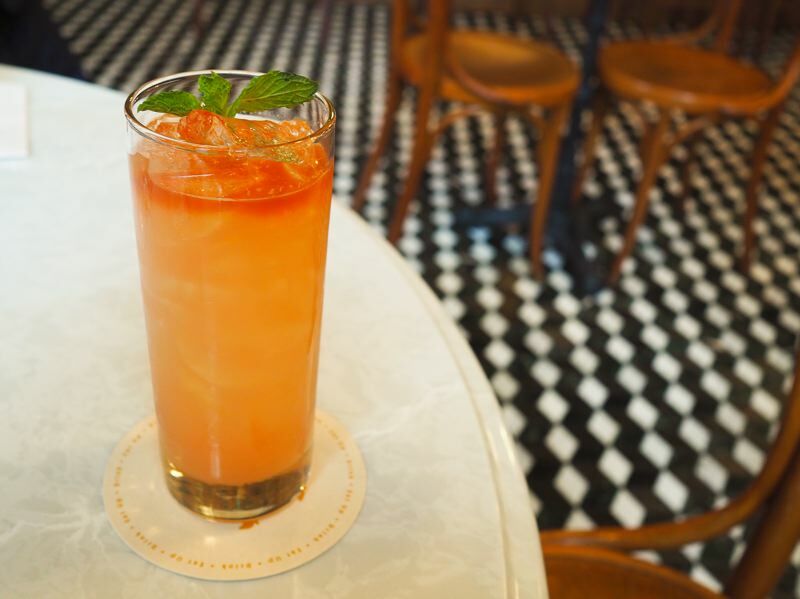 Boozeless beverages abound at Portland restaurants such as Headwaters, Imperial, and the new Rosa Rosa wine bar, where bar director Charles Hildreth applies traditional drink categories to the process of crafting zero-alcohol beverages. To him that means making something "that's dry, light, maybe effervescent and probably a bit bitter." • Soup's on at the Winter Soup Fest at the Portland Mercado, 7238 S.E. 74th at Foster Road. Sample warm and hearty pozole (made from dried corn), tortilla soup, and stews from Jan. 25-26. Explore the convivial atmosphere and get a taste of the collaborative sprit that makes Portland a veritable Crockpot of culinary talent. • Jenn Topliff is a gourmet macaroon maker new on the scene. Her product is called Roons, and she just expanded her culinary operation to a new production facility on Southeast Powell Boulevard. This week, Topliff jets to San Francisco's Winter Fancy Food Show with a suitcase packed with Roons, and her just-launched bite-size macaroons, Lil Roonies. The treats, made of toasted coconut formed into little haystack-shapes, are hand-dipped in Guittard chocolate. Roons can be found in Portland bakeries and grocery stores. Available in year-round and seasonal flavors, Roons are gluten-free and grain free. • Crave a deep, damp fungus? Head to Eugene for the 2019 Oregon Truffle Festival, a two-day celebration of our state's world-class native black and white truffles. Events include muddy foraging trips, fancy wine dinners, and truffle-hunting dog shows. The Joriad North American Truffle Dog Championship happens from 9 a.m.-noon Jan. 24 inside the Lane Center Large Animal Events Arena. (Sorry, four-legged friends not enrolled and participating in the event aren't allowed.) Later that day, the winners participate in "Into the Woods," a "head to head, nose to ground" canine event held outdoors. • New Orleans' Mardi Gras celebration started Jan. 6, and with Fat Tuesday approaching March 5, it's a perfect time to visit NOLA Doughnuts. The New Orleans-style bakery and café has locations in Lake Oswego and the Pearl District, where it serves beignets and New Orleans-style donuts. All donuts are made over three days using classic French pastry techniques. 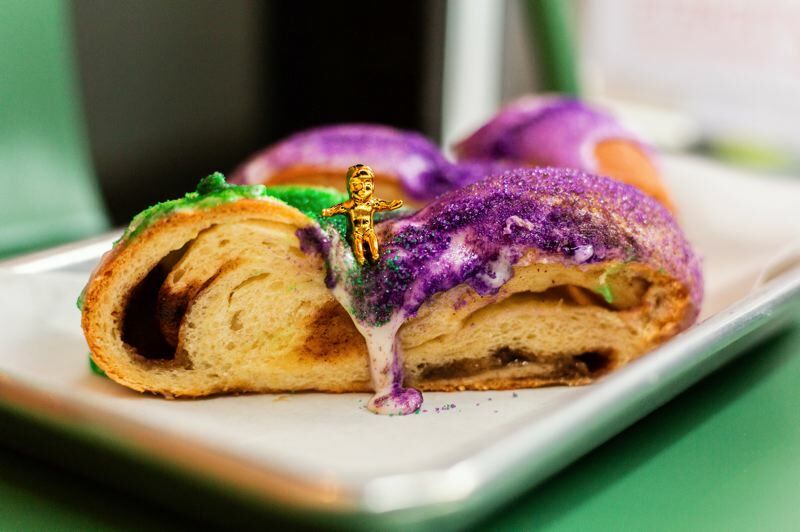 In honor of upcoming Mardi Gras festivities, NOLA will bake traditional Louisiana-style King Cake for Carnival. The cake is covered in purple, green and gold sugar, and the small baby (the little trinket that bestows a kind of luck) is served on the side. Allow three days for all your King Cake orders. • Summer (June 26) brings the ninth annual Saké Fest PDX to the Oregon Convention Center, a one-day event that showcases the finest U.S. and Japanese saké brands. The event quenches our desire for lighter, rice-based refreshment. A main sponsor of Saké Fest PDX is Forest Grove-based Saké One, makers of the Momakawa sake line. • On Sept. 12-15, a swarm of people will descend on our city for Feast Portland, the food festival that ate Portland. The sprawling event features spirited chef competitions, night markets, and an overwhelming amount of food to taste. Sponsored by Bon Appetit, the event raises funds for Hunger Free Oregon and Urban Gleaners. • Meanwhile, here's eggs-iting news: One of Portland's most popular carts, Fried Egg I'm In Love, is opening a permanent storefront at 3549 S.E. Hawthorne Blvd. on Jan. 24 in the space last occupied by Blue Star Donuts. From here they'll continue to churn out their music-inspired fried egg sandwiches, such as the Yolko Ono, Egg Zeppelin, Sriracha Mix-A-Lot and Free-Range Against the Machine, but add a fuller menu of breakfast options as well as Bloody Marys and mimosas to the menu. Fried Egg will continue to operate its cart in Pioneer Courthouse Square.